We come to you! We've fixed dings at your location since 1994. Paintless dent repair (PDR) is a process of removing small dings and dents from vehicles without sanding, filling, or repainting the original finish of the vehicle. Body panel metal has "memory". It will return to its original shape and contour when massaged into place. In paintless dent repair, we use metal rods to reach inside the body panels and gently massage the dent until it's flush with the surface. Any fine scratches leftover on the clear coat layer, or paint from the car that damaged yours, can be polished off. We don't need to paint, which means you never have to worry about the repair matching your original finish. Repair of one ding/dent takes about an hour or less. No need to rent a vehicle or be without for an extended period. You will likely save hundreds of dollars, compared to having repairs made at a conventional body shop. Repairing dings and dents increases the value of your vehicle and makes it easier to sell. Free mobile service; we can perform the repair wherever YOU are. Returning a ding-free leased vehicle will save you money on "excessive wear & tear" charges from the manufacturer. Most auto insurance will cover Zing-A-Ding repairs, however, most repairs will cost less than your deductible. 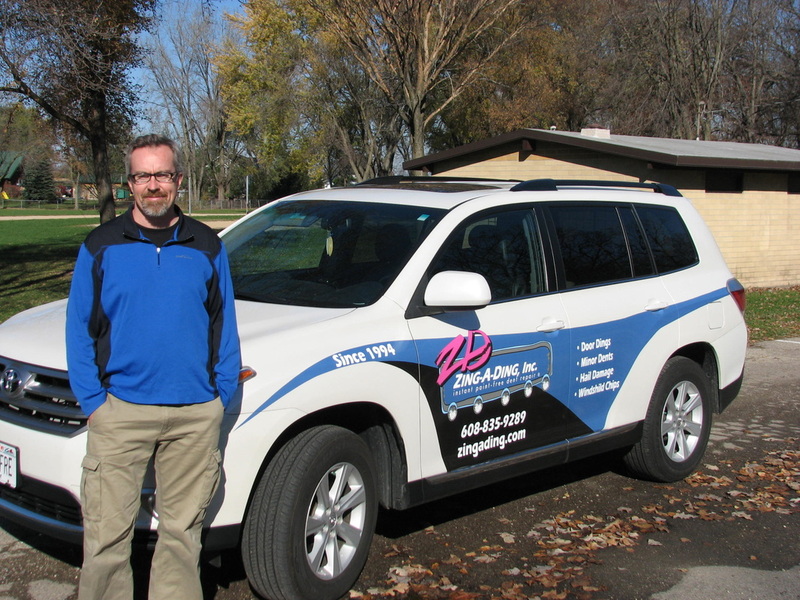 Zing-A-Ding guarantees it's professional services are performed to the highest standards of skilled workmanship. If you are not satisfied, we are not satisfied. Small & Large Dents- We can repair anything from a slight wave, to a dent the size of softball. It may be virtually invisible or may look like a minor collision. Whatever the size, they are all annoying. Most can be removed so completely, they become a memory. Hail Damage - Instead of replacing your hood, roof, trunk or other areas of your vehicle with aftermarket parts, let Zing-A-Ding make the repairs and keep your original sheet metal in tact. The cost to repair using PDR generally costs half of what it would to use traditional body shop techniques. Creases - Creases can be removed as long as the metal has not been "stretched" too far. Even if the crease is too large to be removed completely, it can often be improved enough so the after effect is barely noticeable. Normally, the cost of our PDR services will fall below the deductible that most people elect to carry on their auto insurance. If you have just a few small dents and dings, this will probably apply to you. 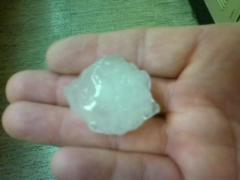 However, if your damage is more substantial, as in hail damage, we encourage you contact your insurance company first. Many times agents will suggest having PDR done instead of conventional body work. Then contact us for a free estimate. We have restored countless vehicles to their pre-hail condition! If you have ever leased a car, this will probably sound familiar - at the end of the lease term, you returned your car and were told there would be an additional charge for damage to it. 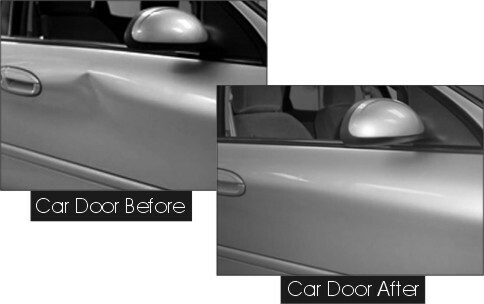 We can save you a considerable amount of money by repairing those dings before you turn the car in. Find out what the terms are for your lease before it's time to turn the vehicle in. Most leasing companies will give you a preliminary estimate. You may have the option to make the repairs now, instead of paying them to do it later. After having your preliminary inspection and finding out the cost of additional charges, let us look over the car with you for unsightly dings and dents. Chances are our charges will be much less that that of the leasing company. In addition to having your dings and dents repaired prior to the end of your lease, Zing-A-Ding can also repair your windshield chips. In fact, most insurance companies will pay for the repair and waive your deductible. That means the cost of the repair for you is FREE! We also work closely with restorers who will repair just about anything deemed "damaged" by your leasing company. This includes paint scratches, paint chips, torn or burnt leather, cloth or carpets, broken antennas, stain removal and many other types of damage. Contact us for more information.